The Economic and Financial Crimes Commission on Monday arraigned the immediate-past Governor of Ekiti State, Mr Ayodele Fayose, for an alleged fraud of N2.2bn. Fayose was arraigned before the Federal High Court in Lagos six days after he completed his tenure as governor. 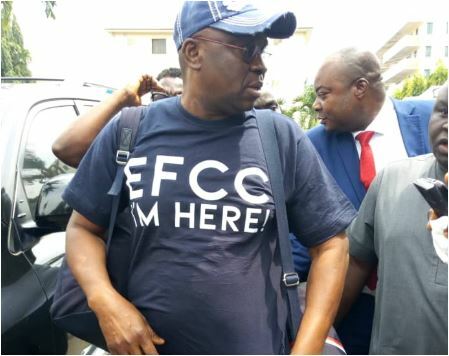 Dressed in blue jean trousers and a shirt of purple, blue, white and grey colours, Fayose was brought to the court premises in a white EFCC bus, accompanied by security operatives. On hand to give Fayose encouragement was a former Minister of Aviation, Chief Femi Fani-Kayode, who is himself being prosecuted by the EFCC for an alleged fraud of N4.9bn. “I am here to let people know that he (Fayose) is not alone. I know what he’s going through because I’ve been there,” Fani-Kayode told journalists on the court premises. Soon after entering the courtroom, Fayose was called up into the dock, where he took his plea on the 11 counts filed against him and his company, Spotless Limited. He pleaded not guilty on behalf of himself and his firm, Spotless Limited, to the 11 charges bordering on criminal breach of trust, theft and money laundering. Among other allegations, the EFCC further accused Fayose of receiving gratification from a firm, Samchase Nigeria Limited. After pleading not guilty to the charges, the prosecuting counsel for the EFCC, Mr Rotimi Oyedepo, prayed for a trial date and an order remanding Fayose in the prison custody. However, the defence counsel, Chief Kanu Agabi (SAN), told Justice Olatoregun that while he agreed with a trial date, he was opposed to the prayer that his client should be remanded in the prison custody. Agabi said he had already filed a bail application for Fayose and urged the judge to allow the former governor to return to the custody of the EFCC pending the hearing and determination of the bail application. Justice Olatoregun granted Agabi’s prayer, ordered that Fayose should be remanded in the custody of the EFCC and adjourned till Wednesday, October 24, for the hearing of the bail application. The EFCC has listed 22 witnesses that will testify against Fayose in the course of the trial. They include Obanikoro and a former Group Managing Director of Diamond Bank Plc, Mr Alex Otti. Otti is expected to tell the court how sometime in 2014, Obanikoro approached him in his Lagos office, saying he expected the Central Bank of Nigeria to pay certain sums of money into the Diamond Bank account of a firm, Sylvan Mcmanara Ltd, and that he needed the money or most of it transferred to Ekiti. Otti is expected to tell the court how Diamond Bank offered to transfer the money electronically but Obanikoro insisted that he wanted the money delivered in cash in Ekiti. The bank then proposed a service charge of five per cent, which Obanikoro rejected and rather opted to fly the money by himself to Ekiti.